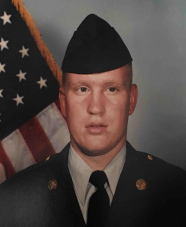 U.S. Army Private First Class John Etterlee joined the military two weeks after the September 11th terrorist attacks because he wanted to serve and defend his country. He served for nearly 15 years before being honorably discharged in 2015. Throughout his more than decade of service, which included tours in Iraq, Private First Class Etterlee suffered many injuries, most notably a spinal injury that worsened while he was in combat and caused him to be transported by medevac. In addition to his severe spinal injury, Private First Class Etterlee suffers from PTSD, sleep apnea and knee pain. For service to his country, Private First Class Etterlee has been awarded the Iraq Campaign Medal w/ 4 Campaign Stars, Army Achievement Medal (3x), Valorous Unit Award, Army Good Conduct Medal (2x), National Defense Service Medal, Global War on Terrorism Expeditionary Medal and the Global War on Terrorism Service Medal. Private First Class Etterlee and his wife, Elizabeth, received a mortgage-free home in High Point, North Carolina.